If there’s a company with enough influence in the fashion industry to make Vogue quiver in their designer boots, it’s Net-A-Porter. The ‘fashion bible’ is facing serious competition, as the global luxury online fashion retailer, Net-A-Porter revealed the very first issue of their glossy Porter magazine. Porter is a revolutionary magazine; as the creation of a fashion empire and not of a typical publisher. Net-A-Porter will be releasing six issues a year at £5 each, and editor, Lucy Yeomans says the publication is aimed at ‘sophisticated women of the world’, and it is unique because unlike Vogue who have editions for different countries, Porter will launch just one global edition. 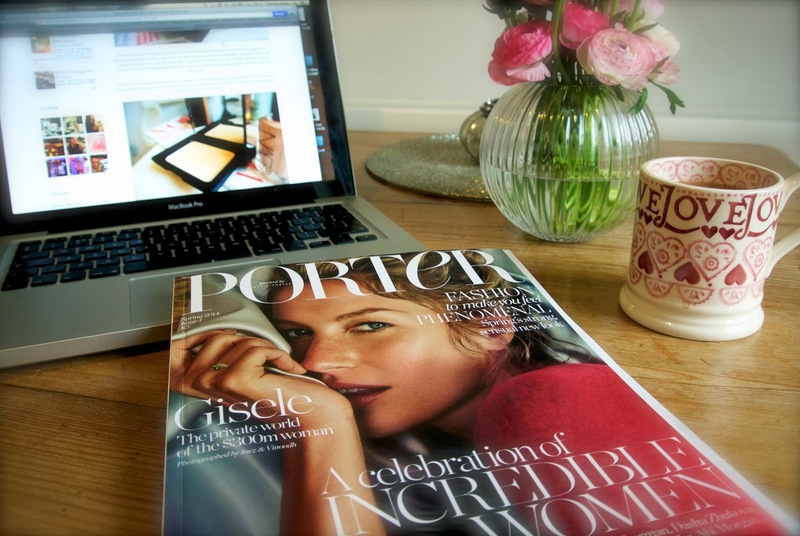 I have to admit that I did first imagine Porter to be a glossy sales brochure for Net-A-Porter, so I was happy to be proved wrong upon finding a range of brands within the magazine, including some not available from Net-A-Porter. Having said that, shopping from the pages of Porter couldn’t be easier; the magazine uses image recognition software so readers can use their smartphones to scan images and buy straight from the pages. 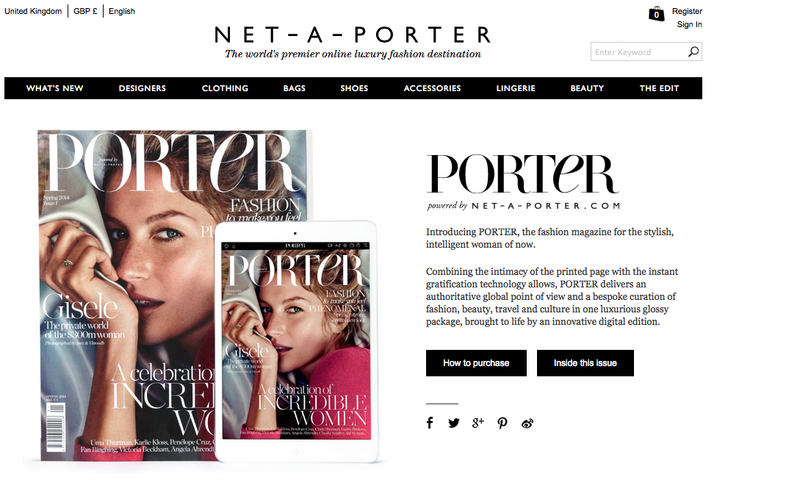 As omni-channel retailing becomes so crucial to retailers today, Net-A-Porter appear to have come a full circle by starting online, and now offering a physical distribution point for their luxury products. The contents of the magazine are as sleek and tasteful as the edit of fabulous fashion on Net-A-Porter.com. As an adept reader of Vogue, I found Porter a refreshingly preppy read, with editorials from fashion greats such as Manolo Blahnik revealing why the mule is the shoe style of the moment within their ‘Fashion Memo’ section, and interviews with ‘incredible women’ including Angela Ahrendts and Julianne Moore. The beauty section is satisfyingly thorough, with reviews of the latest innovative products, as well as an educational report on the buzzwords of the industry. 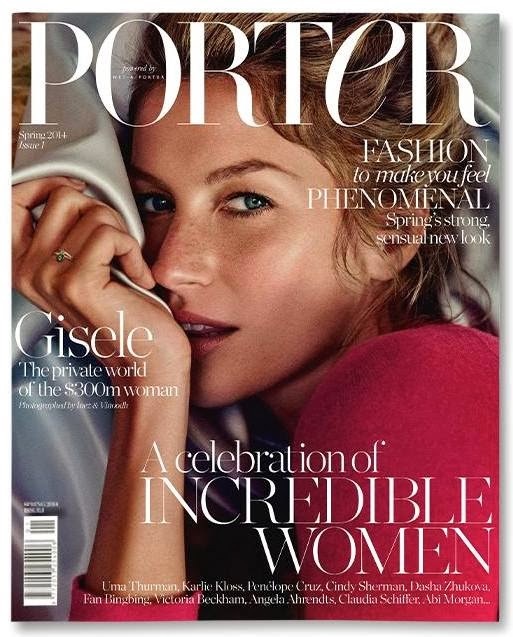 Of course Porter has ruffled some feathers; editor of UK Vogue, Alexandra Shulman likened Porter to a ‘grand Sainsburys magazine’ – ouch – well, at least it wasn’t Tesco. Vogue’s publisher has recently enlisted it’s own online retail guru to assess the shop ability of the Conde Nast titles, no doubt an attempt to even out the score with the newcomer on the block. Porter is available to purchase in most newsagents (and Sainsburys! ), and also online from Net-A-Porter. Have you picked up a copy of Porter yet? Let me know your thoughts!